Tom's Guide reports that the Android operating system is now under heavy attack in comparison to other mobile platforms. When the article mentions 'threats' it means individual Trojans in almost all cases. Viruses and worms don't really feature at all in recent years. 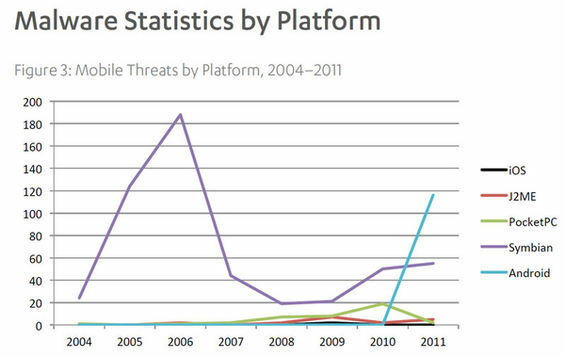 "The number of threats directed at Android in 2011 was a sharp increase from only 9 threats in 2010 -- only trumped by the number of threats for Symbian in 2006 (188) and 2005 (125). Since 2004, F-Secure listed a total of 710 security threats for mobile device. 525 of those affect Symbian, 125 Android, 40 PocketPC, 18 J2ME and 2 iOS. The vast majority of all mobile threats were trojans (519 overall, 136 in 2011). Viruses (56 total) have not been seen since 2007 and worms (38 total) appear to have been abandoned as well." It will be interesting to see if/when the latest Windows mobile operating system appears on the chart.